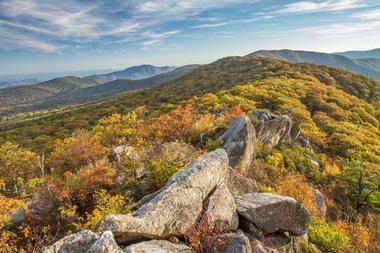 Virginia is home to Shenandoah National Park and contains almost 25% of the famous Appalachian Trail. 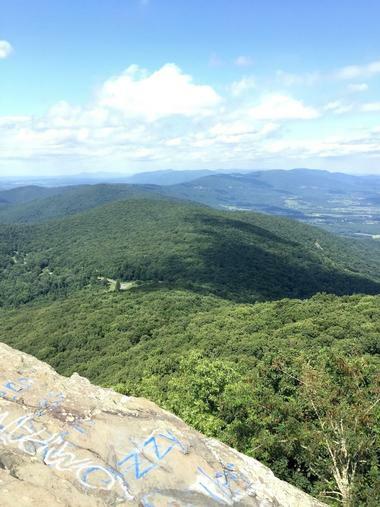 Whether you are looking for a quick day hike with the family or a multi-day backpacking trip along the AT, in Virginia you will find mountains, rock formations, old mines, wild ponies, and an abundance of natural beauty in this great state. Heading up to Blackrock Summit for sunrise or sunset will provide hikers with unobstructed views of the colors in the sky as well as the lovely light as it spreads over the surrounding landscape, but this hike is also quite pretty at any other time of day as well. There are several route options for reaching the top, and both are under 2 miles in length. One goes out and back via the Appalachian Trail right to the summit for about a mile, and the other takes that way up but then meanders down the Blackrock Spur Trail for a slightly longer 1.6-mile trip. Blackrock Summit is located in Shenandoah National Park, which is open year round, but the road to the trailhead – Skyline Drive – is sometimes closed during inclement winter weather. This segment of the Appalachian Trail is a long one, measuring over 54 miles in length, but it’s a beautiful one that follows the ridges and spines of the Blue Ridge Mountains with great views of the valleys below. Many shorter hikes can be done from this longer stretch, like Chester Gap to Linden, which is about 8 miles and allows hikers to see all the beauty of the AT without a multi-day excursion or a need for backpacking gear. The mountains here along this stretch of the trail are quiet and peaceful, with abundant wildlife and some diverse nature. A round trip hike to the summit of Cole Mountain requires 5.8 miles of hiking and about 1,500 feet in elevation gain. It’s an intermediate level loop trail that winds through the George Washington National Forest and follows the Hotel Trail (blue blazes) to the Appalachian Trail (white blazes), which leads to the top. The summit of Cole Mountain is bald, meaning there’s plenty of meadowy space for a picnic while hikers rest and prepare for the journey back down. A hike on Cole Mountain can easily be combined with Mount Pleasant, which has equally beautiful views from its summit. 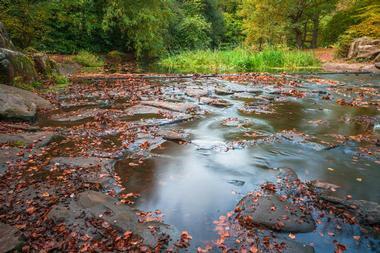 As Crabtree Creek makes its way to the Tye River, it descends over 1,800 feet in elevation. Hiking Crabtree Falls follows this creek, and along the way hikers will find five beautiful and picturesque cascades. The tallest of them, Crabtree Falls, is the highest waterfall in the Virginia Blue Ridge Mountains, and it’s very beautiful. The trail can be anywhere from 2 miles to 6 miles long, and is rated as moderate or difficult due to the fact that many of the rocks on the trail can become quite slippery when they are wet, and also because of the steep incline for some of the trail. But although Crabtree Falls is a challenging hike, it is a popular one in Virginia, and once hikers see the views from the waterfall, it’s easy to understand why. 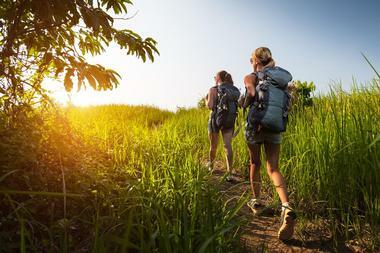 Virginia is home to almost a quarter of the entire Appalachian Trail, which can take a hiker about 12 weeks to traverse from north to south. But for those who aren’t ready to take on that kind of commitment, there are plenty of shorter day hikes or backpacking trips along the AT. The Damascus to Marion segment of the Appalachian Trail is 63.8 miles of beautiful wilderness, steep climbs, and abundant wildlife, including wild horses. 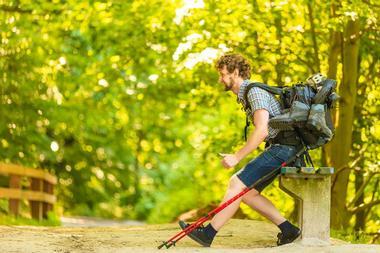 The entire segment can be done in a recommended 7 days, though fast hikers can achieve it in 5. The terrain is diverse and the scenery is breathtaking, and while this is a difficult hike to be sure, it’s definitely a rewarding one. This 4-mile loop hike features two beautiful waterfalls, Dark Hollow Falls and Rose River Falls. 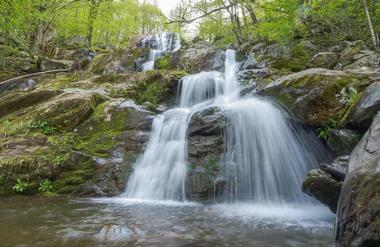 Starting at Skyline Drive in Shenandoah National Park, hikers can take the Rose River Fire Road to the Dark Hollow Falls Trail, where they will hike a steep ascent to the falls. From there, they will take the Rose River Loop Trail, which follows a gorgeous stream full of scenic cascades and leads past an old mine. Rose River Falls will be just beyond, and it’s a great spot to stop and enjoy the scenery before continuing along the loop back to the trailhead. The loop is not particularly difficult, though it could be treacherous in inclement weather. The Dragon’s Tooth is a unique rock formation that can be reached via a 4.6-mile out and back trail. The parking lot for the trailhead generally gets full around midday, so hikers looking for solitude should plan on an early start. The Dragon’s Tooth Trail leads hikers across a creek and through the woods to the Appalachian Trail, where they will follow an exposed section (so wear sunscreen and bring lots of water!) up a steep incline to the Tooth. Some of this section of the trail may involve climbing, but there are metal footholds in the more tricky parts. There’s a beautiful view from the top of the Tooth, and it’s a great spot for a picnic or at least a few photos. 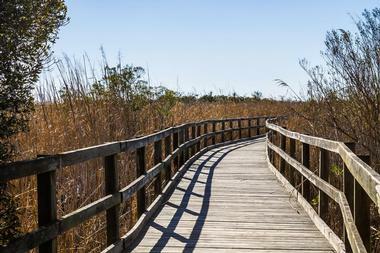 False Cape State Park is located on one of the barrier islands on the coast of Virginia. This unique ecosystem means there is an abundance of nature and wildlife, and by hiking through the area, visitors may catch a glimpse of birds, wild pigs, foxes, and even bobcats. The park is a neat mix of beach, marsh, and other landscapes, and visitors will even find the remnants of civilization in the form of an old cemetery, abandoned cars from the early 1900s, and even a shipwreck that can be spotted in the water at low tide. Great Falls Park is a small but pretty national park area located on a stretch of land along the Potomac River. Located only 15 miles from Richmond, Great Falls Park is easily accessible for a day trip and features many lovely trails where hikers can enjoy the beauty of the river. 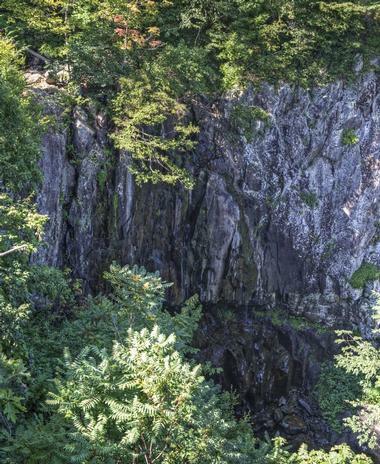 Visitors can hike to the Great Falls of the Potomac River at the park’s northern edge or visit the historic Patowmack Canal, which is the oldest canals and first ever built in the United States with locks for raising and lowering boats that passed through. Many of these sights are accessible by car, but there is also a 15-mile hiking trail called Difficult Run, which follows a stream, and also many opportunities for rock climbing within the park. 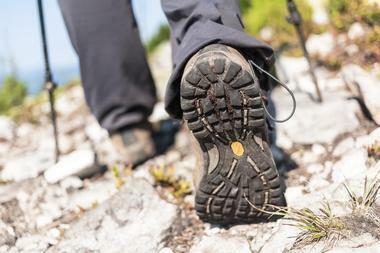 There are two out and back hiking trails to House Mountain. Hikers can choose between the Little House Mountain Trail, which clocks in at 8.75 miles round trip, or the Big House Mountain Trail, which ironically is shorter and measures approximately 6 miles. Both trails are scenic and pretty, with overlooks viewing the surrounding area, but they do both feature a hefty elevation gain of about 2,850 feet, so hikers should be prepared by bringing lots of water and taking their time on the trail. The scenic overlooks at the summit are a great place to enjoy a snack or some lunch, or at the very least a short rest, before heading back down the trail. Humpback Rocks is one of the most heavily used hiking trails in the region, with a lot of its popularity attributed to its short length and its beautiful views. Although it’s only one mile to the top, the Humpback Rocks Trail is incredibly steep, and it usually takes people about 45 minutes to an hour to get to the summit. The trailhead is just a short 5-mile drive from the Blue Ridge Parkway, and while it can be pretty busy on the weekends, a weekday hike to Humpback Rocks can be very peaceful and quiet. 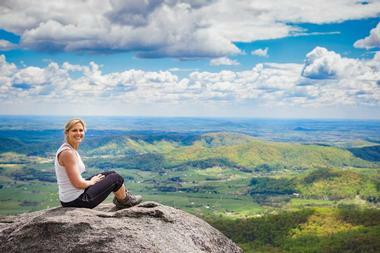 Humpback Rocks has a gorgeous view, and it’s a great place to watch the sunrise, enjoy a picnic lunch, or to take a beer from one of the local Virginia breweries in the region. Along Skyline Drive in Shenandoah National Park, hikers can park in the Big Meadows area at milepost 51.2. 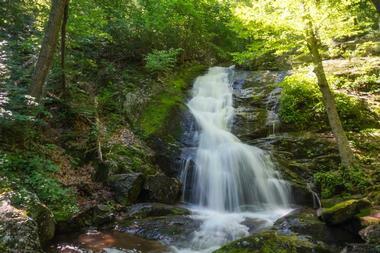 From there, the Lewis Springs Falls trailhead is near the amphitheater. 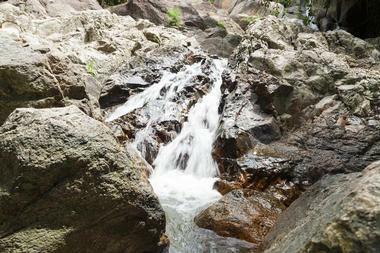 This 2.8-mile loop is rated as moderate to difficult due to the slippery rocks, river crossing, and loose, rocky trail. The falls at the end of the trail are pretty, with an overlook area, and are a great place to stop for lunch or a rest before completing the loop back to the trailhead. The elevation gain during this hike is approximately 816 feet. 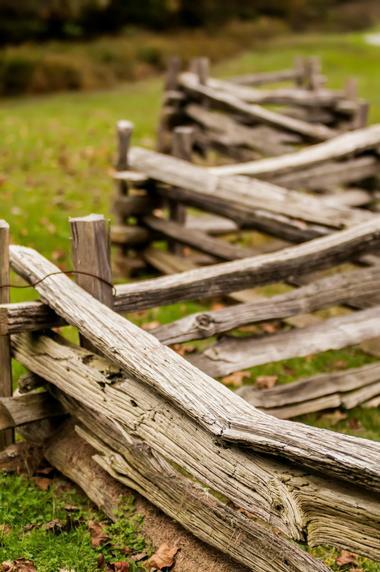 The Limberlost Trail is flat and even wheelchair accessible, making it a great choice for families, seniors, or others who don’t feel comfortable handling some of the more tough hiking terrain in Virginia. This 1.3-mile loop in Shenandoah National Park was once home to ancient, old growth hemlock trees, which unfortunately were killed in the 1990s by an invasive insect, hence the trail’s name. But despite the loss of these beautiful trees, Limberlost Trail is still beautiful, with a growing and changing ecosystem of trees, fields, and wildlife. The Limberlost Trail is a great place to get out of the car and stretch your legs after driving for so long through the park. 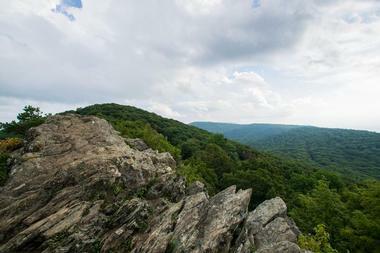 From Mary’s Rock, visitors can see 180 degrees into the Shenandoah Valley, Thornton Gap, and the mountains in the surrounding area. 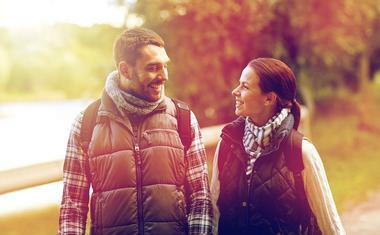 It’s a gorgeous view, and to get to it, hikers can take one of several routes to the top. The shortest, at 2.8 miles, is the Meadow Spring Trail, but other options include Panorama (3.7 miles), Jewell Hollow Overlook (6 miles), and Buck Hollow (9 miles total). Each of these hikes are lovely and peaceful, through woods and up slopes to the view at Mary’s Rock, and some of them pass by old homesteads, camping shelters, and other features. All of the trail options intersect with the AT, which can be taken to Mary’s Rock Lookout Trail, which goes all the way to the top. Hiking the 8.8-mile out and back trail to McAfee Knob is long, but fairly straightforward and totally doable for beginners looking to challenge themselves. 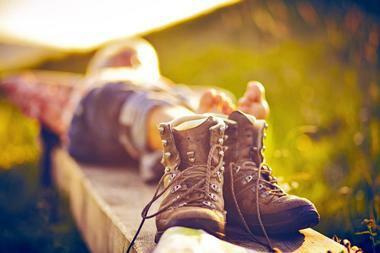 It’s a great way to ease into hiking on the Appalachian Trail, and the parking lot to the trail can be found on Rt 311. 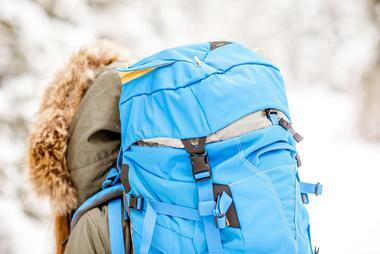 Along the way, hikers will follow the well-marked trail and its white blazers to encounter shelters and a water source to top off their bottles. Most of the trail is wooded, but the summit of McAfee Knob, at 4.4 miles through the hike, is incredible scenic, with a rock overlook and great views of the Shenandoah Valley. There are plenty of spots to camp along the trail, and in fact this is recommended for those who want to grab some amazing photos during sunrise or sunset. 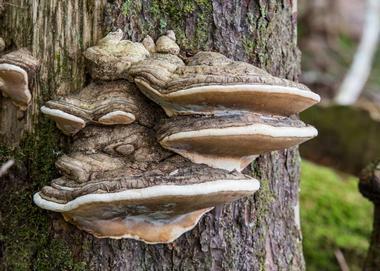 Mount Rogers is a gorgeous hike on its own, but many people love this one because of the wildlife. 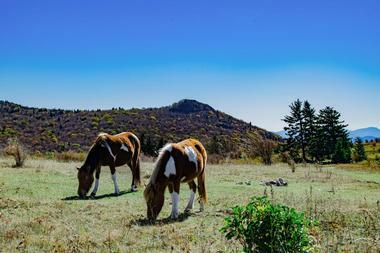 The mountain is home to several herds of wild ponies, which can often be spotted grazing in the meadows and fields of the mountainside. Hikers should note that although the ponies are friendly and accustomed to people, they are still wild animals and should not be fed, no matter how tempting it may be. By taking the Rhododendron Trail to the Appalachian Trail, hikers can get to the summit on an 8-mile loop. The top of Mount Rogers doesn’t offer any real views, but the hike there has enough scenery to make up for that fact. There is a ton of natural life on Mount Rogers, from the wild blueberries that grow there during the summer to the fiery reds and oranges of the leaves during the autumn. The trailhead for Old Rag Mountain is located in Etlan, Virginia, and the parking lot fills quickly for this popular trail, so an early start will help ensure a spot as well as lower any frustration at the traffic on some of the rock scrambles. The loop trail is about 9 miles in total with over 2,500 feet elevation gain, and hikers will reach the summit of Old Rag Mountain after about 4.5 miles. The view from the top is simply stunning, and makes the whole hike completely worth the hassle of scrambling over scree fields and boulders. Many people pack a lunch and relax at the top for a big before heading down along the Saddle Trail and Weakley Hollow Fire Road. This out and back trail near Bentonville is not easy, but the 6.1 miles of hiking will reward those who attempt it with a beautiful view of Overall Run Falls, the highest waterfall in Shenandoah. 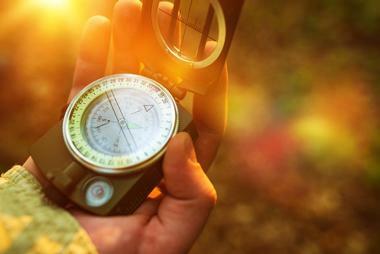 From the Appalachian Trail, hikers will wind their way through a pleasant mountain trail, then down Hogback Mountain. On the way to the big falls, visitors will find Twin Falls, a wide and scenic place to stop for a quick rest before continuing on to Overall Run Falls. Dogs are allowed on this trail, and it can become quite crowded during peak hiking season, so an early start is required for those looking for some solitude. The Peaks of Otter Recreation Area is located just off the Blue Ridge Parkway and contains over 4,000 acres of mountains, valleys, forests, and trails to explore. Hikers on the Peaks of Otter Trail between mileposts 83.1 and 85.9 will find many options for their trek, from a 0.8-mile hike to a much longer 5.8-mile lollipop loop where hikers will find waterfalls, rock formations, boulders, and more. Crowds can be heavy during the summer and warmer months, but Peaks of Otter is open year round, and dogs are allowed on trails. 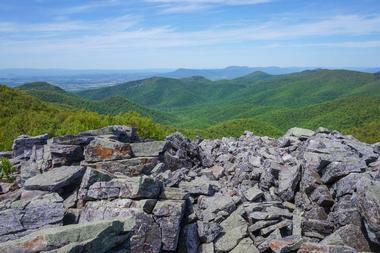 This section of the Appalachian Trail once connected Roanoke with Rockfish Gap until the Blue Ridge Parkway was built. The trail was then pushed into some of the nearby peaks, making the segment of trail from Roanoke to Rockfish Gap a bit more tricky, but just as beautiful. Hikers who love to climb will find ample opportunity here, with rock formations and sheer cliff walls for climbers of many abilities. The trail is dog friendly, but can be quite difficult, so both hikers and four-legged companions should be in good shape and ready for a long and strenuous journey. 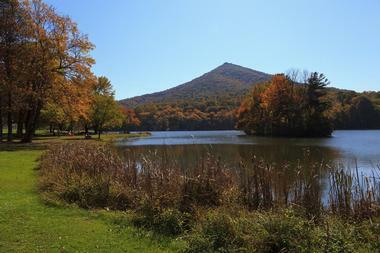 The Sharp Top Trail is a popular trail located near Bedford, which can be quite busy with college students from the surrounding universities. 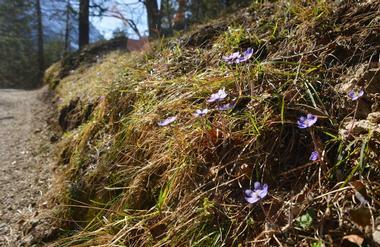 The trail is steep and can be quite tiring, with lots of rock stairs and some serious elevation change. After a mile of hiking, there is a beautiful overlook, and after another half a mile, hikers will find an old stone cabin at the Sharp Top, which can be used as a shelter in rain or thunderstorms. 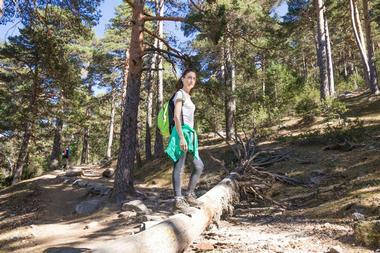 The trail features lots of boulders for climbing and lots of beautiful views for those who bring a camera. Bears have been spotted on this trail, so hikers should keep their eyes peeled and know basic wildlife safety. The Religious Range, consisting of peaks like the Priest, the Friar, and the Cardinal, are some truly gorgeous parts of the Blue Ridge Mountains, and Spy Rock Trail, in the George Washington National Forest, offers some gorgeous views at these peaks and much more. The trail is 3.1 miles total, and it’s really easy to combine Spy Rock Trail with some other small, local trails nearby, such as Crabtree Falls. To reach Spy Rock, hikers will take the Appalachian Trail to the Spur Trail, which leads to a quick scramble to get to the top of Spy Rock. It’s doable for athletic dogs, and is a very local trail, meaning it’s rarely crowded with tourists. 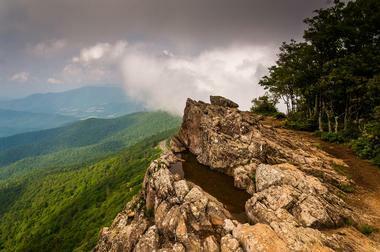 Stony Man, located in Shenandoah National Park, is an easy hike whose trailhead is located near the Skyland Resort. There are several options for traversing the Stony Man Trail, from an easy loop along the Appalachian Trail and the Stony Man Trail to a longer and more moderate trek on the Appalachian, Passamaquoddy, and Stony Man Trails. 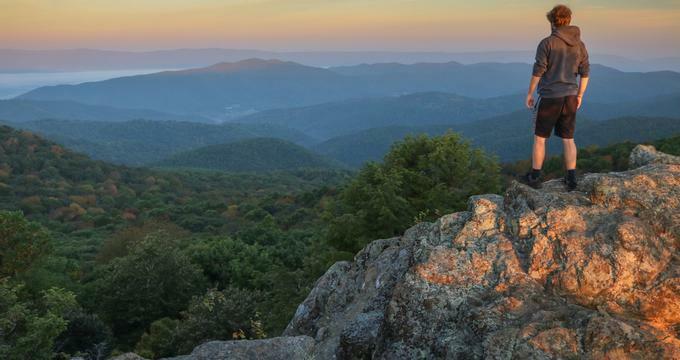 Whichever option you choose, the final viewpoint offers some breathtaking views of Shenandoah National Park and some great views along the way. Hikers should note that dogs are not permitted on this trail. This dog-friendly out and back trail near Sherando, Virginia, is beautiful, with lots of waterfalls and lovely greenery along the way. The trail is approximately 1.8 miles and is fairly easy for most of the way, with a slightly more difficult stretch of stairs at the end that gives White Rock Falls Trail its moderate rating. Many people take their children on this trail, so it has a reputation as a family-friendly place with a lot of room to explore, and the trek can be quite heavily trafficked on weekends or holidays. The falls at the end of the trail are tall and picturesque, and the rocky pools at the bottom are great for wading and cooling off, though not deep enough for a swim.